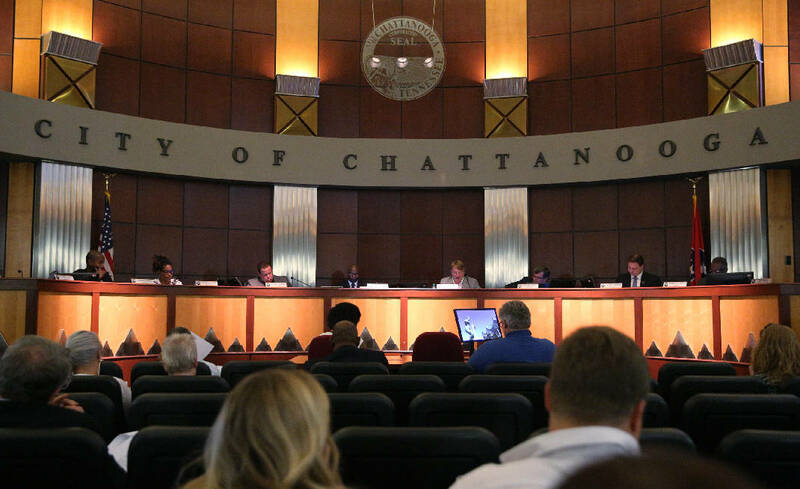 The Chattanooga City Council holds a voting session on Aug. 22, 2017, during which David Roddy was confirmed as the city's new police chief in an 8-1 vote. Chattanooga builders told Chattanooga City Council members Tuesday that proposed restrictions to construction on steep slopes and flood plains would damage the homebuilding industry, cost jobs and drive up the price of housing. Council members are weighing a delicate problem. The growing city's hunger for new homes is pushing development into more fragile lands, up on hillsides and down along creeks. Runoff and slippage can damage neighboring homes and the environment. Between 2013 and 2018, according to figures from the Chattanooga-Hamilton County Regional Planning Agency, more than 83 percent of the nearly 600 zoning cases were for developments on steep slopes, in flood plains or both. At an Oct. 30 public meeting, a dozen people from around the city got up and told council members they support some controls on development in those environmentally fragile areas. But at another hearing Tuesday, builders and developers told their side of the story as the council discussed a proposed resolution to temporarily limit grading and clearing in some steep or low areas. The Regional Planning Agency has been working for months on a more permanent set of rules. Councilman Darrin Ledford, the panel's chairman of planning and zoning, said the proposed resolution was not yet on the council's agenda and that everything's still in the talking phase in what he called a "collaborative" and "transparent" process. "This is important because we have a lack of clear expectations, we have no measurable criteria or standards when it comes to rezoning requests for steep slopes and flood plains," Ledford said. And since a 2014 law stripped cities of their power of forced annexation, Chattanooga can't just reach out and grab new territory, he added. "We need to set rules," Ledford said. "Our future action is not intended to hinder or cause complications for developers and home builders but to set standards and provide clarity." The temporary resolution would allow grading or clearing on no more than 20 percent of any property where the slope is 33 percent or greater. It would limit clearing and filling to 50 percent of a tract in a floodplain. And it would require that where the site plan calls for a retaining wall, the wall must be built before the house or other structure is constructed. The rules, which would take effect when approved by the council, would affect only developments that have not yet been through the zoning approval approval process. Barry Bennett, longtime former director of the Chattanooga-Hamilton County Regional Planning Agency, spoke for the roomful of builders in saying such rules "could possibly result in a de facto moratorium on development in the Chattanooga area." "This new proposal limits the new homes available and results in driving up the prices of the limited number of new homes that are available," Bennett told council members. That would be a blow to the city's efforts to provide more affordable housing, he said. And the ripples from a slowdown or halt in home construction would cost jobs in supplier industries such as building materials and the construction trades, he added. "Their livelihood absolutely depends on the trade received from home builders — that's where most of their products go to," Bennett said. Holding a set of temporary rules over their heads will deter builders from moving ahead with projects and make them eat land and other development expenses, again driving up the price of housing, he said. He asked the council to let builders sit down with planners, the council and other stakeholders to "seek agreement on a good balance of interests for builders and community needs for housing." Fine, said Ledford, but don't take too long. "If you have solutions to help us, please present them, and present them quickly," he said. "We're all on the same side, moving Chattanooga forward." Also Tuesday, the council voted to continue funding Baby University through Signal Centers. Money for the program was boosted by $175,000 this year. Elizabeth Cotellese, director of the program, said 175 families comprising more than 700 people are enrolled in Baby University, and that 100 percent of the enrolled moms received prenatal care. Mayor Andy Berke's signature parent and infant development program works with pregnant girls and women, their husbands and families to ensure babies are born healthy and to work to create successful families. And council members wrestled further with rates for the city's Water Quality Program, which manages surface water and runoff and is paid for by annual fees collected from city residents. As of July 1, fees paid by the average homeowner jumped $115.20 a year to $126.49. Fees are expected to keep going up nearly 10 percent a year and hit $183.54 in 2023. Council members wanted to look for a way to ease the impact of higher fees and asked their consultant, HDR Engineering, what it would cost to look at alternative rate structures. Tuesday, they learned that cost would be around $105,000, plus the cost of implementing a different rate structure. The Public Works Department and the consultant took suggestions from the council on refining their approach and said they would have more information in a few weeks.